We are wondering? You probably are too. One Awesome Thing is conceived upon the idea/reality that life gets lifey sometimes. You can surround yourself by inspirational quotes and happy photos forever but sometimes the only thing that can propel you forward or even just out of an old cycle of thinking/doing is YOU. It is a way of being in the moment. It is a way of being IN ON the moment. This is how it was conceived. Try it. The first step is to think of One Awesome Thing you did today. This is about how you talk to yourself, how easy it actually is to talk yourself into and out of things. It's a way of being kind to yourself, when so rarely we ever are. It's not necessarily about karma or dharma, like helping an elderly person cross the street, but if the act of doing that reminds you of how cool and awesome you really are, then that is what it's about! After you try asking, "What is the One Awesome Thing I did today? " 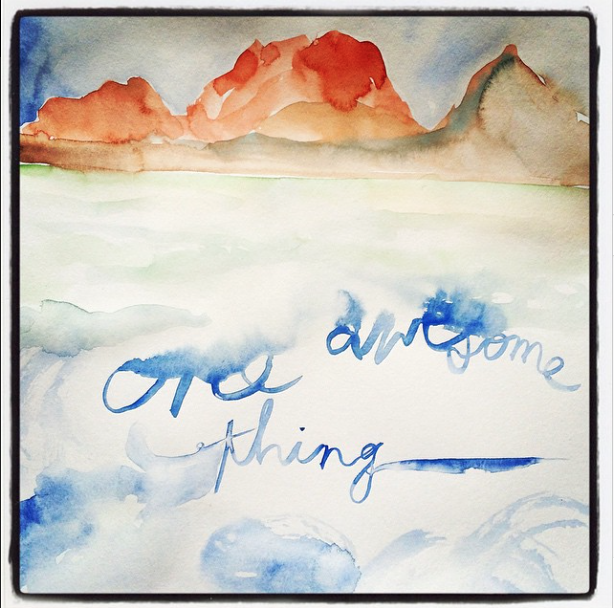 after a while you'll be able to ask, "What's the One Awesome thing I can do in THIS moment?" In the moment when you're about to react, to make a poor life decision, to eat an entire chocolate bunny, to work more than you're playing or play more than you are working, etc. IN THAT MOMENT and that ACT OF ASKING and TRUSTING YOURSELF, you can change what you didn't believe you could change. ONE AWESOME THING is the step before the step (tweet it). Try asking and see if it propels you forward with a joy you had no idea was in you. Share it , Tweet It, Live it #oneawesomething and #oneawesomethingproject and share your One Awesome Things on our One Awesome Thing Facebook, Twitter and Instagram too! With Love from Team Bonbon aka Deb Stein, Founder of The ONE AWESOME THING Project INC.
Deborah Stein is a New York City artist, designer, namer of things, and experience sharer whose company The Bonbon Oiseau Workshop conceives of and collaborates on artworks, real-world projects, objects, installations, and events for advancing the human race via the medium of beauty in any form. Lofty? Hells yeah.